What information do you have about the individual’s work, or about the occupation in general? The story of the occupation, using the person as an example. Responses may be as long or short as you like, and as narrow or broad as you wish. I spent some time thinking about occupations, what they can mean and how that meaning can change over the years, how people stayed with an occupation and how sometimes it took a while to find your occupation. My William Busby was a stonemason and I have spoken before about him. He came from a long line of stonemasons. When he first emigrated he got a job as an Inspector of Works with the Brisbane Council which still related to stonework. After being dismissed from that job (for rudeness per the report in the paper. I still have to do some research and see if I can gain access to the Council minutes). He worked as a monumental mason and did this until his retirement from work and then death in 1928. After winning the design competition for the Caskey Memorial he made a number of very large ornate memorials. So he was a tradesman and kept to his trade. His son, George Howard Busby never went into the stonemason business, the reason for this is unknown although I have my suspicions that George had a bit of a taste for adventure. George had joined the 1st Queensland Regiment, a militia force in Queensland, pre-Federation. He did not got to the Boer War with the official Queensland Contingent, perhaps because he was too young as was only 16 in 1900. However per his World War 1 enlistment papers he served in the Cape Mounted Rifles, during the Boer War, a group that was established in South Africa. I am having trouble confirming this enlistment as so far we have found no records in South Africa but I live in hope. Also on his WW1 papers he said he had served in the New Guinea Police, again currently I have not been able to confirm this but am still looking. In this time period before WW1 he joins the Fire Brigade and was based at the Fortitude Valley Station. He gave evidence at inquiry into the Overells department store in February 1904. A body was found in the burnt-out building and and an inquiry was held as the owner felt that the Brigades response was too slow. George was a member of the Brigade for a few years, long enough to get a tattoo of crossed axes and helmet which was listed on his WW1 records which gave me the clue to start looking for his employment information. Ken Capell co-author of Brisbane Ablaze was able to give me some information about the working conditions. As a brigade member they were required to stay onsite and as George got married in 1904. He is listed in the electoral Roll for 1905 as a fireman. I can understand why he did not stay in the job too many years post marriage. We believe he left sometime in 1906-7 as he is not listed in the 1907 employment list. George completed a st John’s First Aid course in 1909 which was a requirement to be in the Ambulance service. I have this certificate but it didn’t mean anything in particular until I found in Trove that George had his service terminated with the ambulance Brigade in January 1911. In 1914 when he joins up he is listed as being a motor-mechanic. He goes to Gallipoli and that story has been told. He was wounded at Gallipoli and returned to Australia as being unfit for further military service. He then acted as a recruiting sergeant around the southern half of Queensland. After the war George is listed as being an engine driver in the electoral rolls. This would have been a stationary engine driver rather than a railway engine. He had completed his steam ticket certification. I don’t know where George was employed. I do know that George also was into photography and supplied photos to the Brisbane Courier. I do not know whether this was a freelancer or as an paid member of staff. 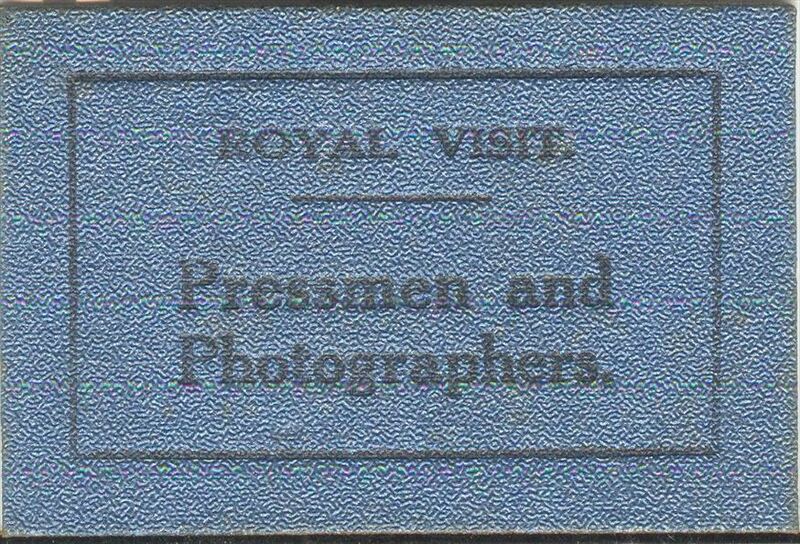 In 1920 George obtained a Press Photographers pass on the occasion of the Prince of Wales’ visit. I have a letter from the Prince of Wales’ secretary thanking George for the photos he had sent. It is interesting to compare William and George’s experience with modern times when it is almost expected that people will have four to five career changes in their working life. These changes are not like Richard John Rollason’s forced career change in 1863 when he changed from being a silk ribbon weaver to a labourer as his profession did not exist in Queensland.